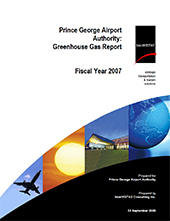 The Prince George Airport Authority (PGAA) committed early in its mandate to ensure that airport operations have a minimal impact on the environment. The PGAA has developed an Environmental & Noise Committee which meets regularly to discuss environmental related matters. Regularly review the policy to ensure that the policy continues to meet the needs and expectations of the PGAA, its employees and the community.